Like many who own an Amazon Kindle or Kindle2, Julie and I have grown to greatly enjoy the convenience of carrying our current and future reading material on our own “virtual book shelves”. The question of how to keep our Kindles protected was one that we had to answer fairly early on, seeing as Amazon did not include any type of cover with our pricey new readers. 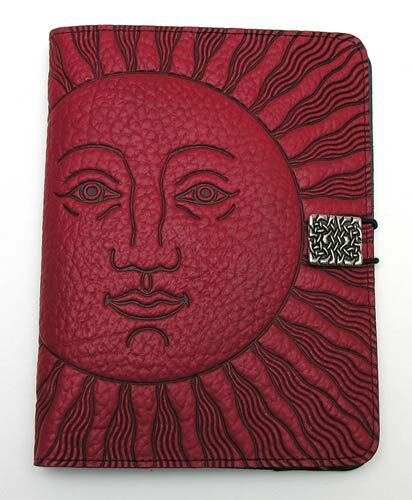 For a while, I kept mine inside a floppy Cole Haan, but that all changed the day I received the Sky Dragon Kindle2 Cover in red from Oberon Design. 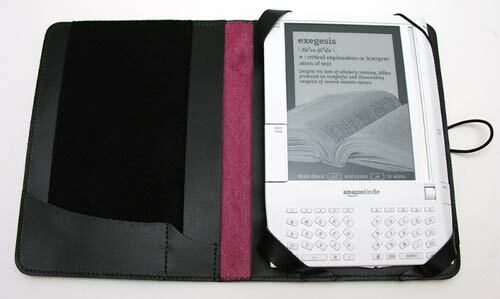 I have been protecting my Kindle 1 and 2 ebook readers with covers from M-edge. 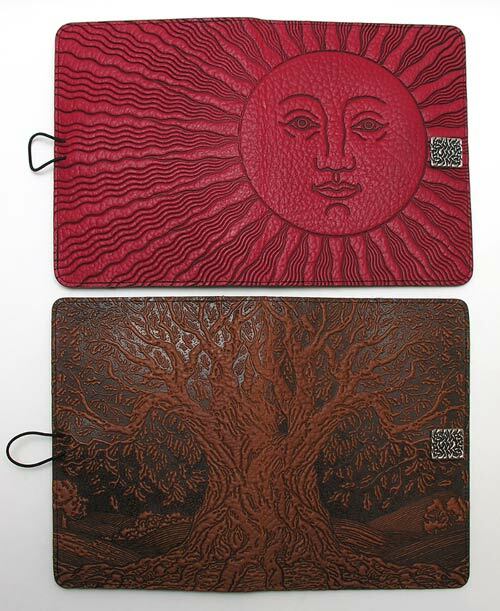 But for this review, I received the Tree of Life Kindle 2 Cover and the Sun Kindle 1 Cover from Oberon Design. I couldn’t help but fall in love with all their gorgeous designs even before I received them in the mail. 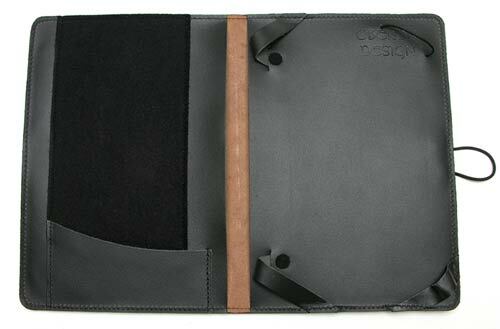 Oberon Design has been around since 1992, in fact you may have seen their leather book and journal covers before. 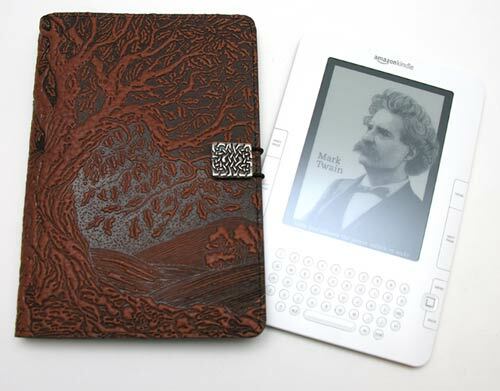 They recently began offering Kindle covers, and I have to say that my first impression was one of wonder. 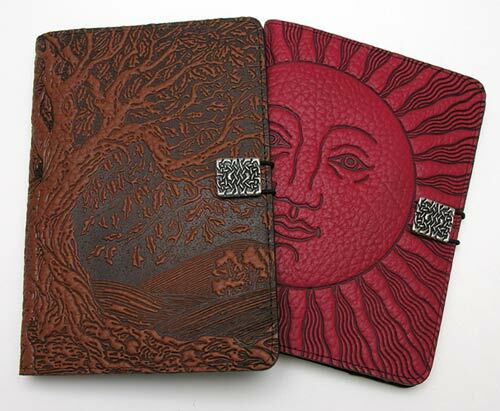 As much as I liked the bomber jacket floppiness of my plain brown leather Kindle wrap, the intricate leather designs on Oberon’s site gave me straight up cover envy! I totally agree. I have enjoyed working with leather myself, so I have always had a great respect for intricate carvings on leather goods. Julie and I were offered our choice of Oberon Design’s Velcro attachment system or their corner straps attachment system. She opted for the cover straps system, while I surprised myself by going for the Velcro; something about how clean the Kindle2 looked without loops on its corners truly appealed to me, even though I have never been a fan of attaching anything directly to my device. No sticky stuff for me thank you very much 😉 Leather straps covering the Kindle’s corners didn’t really worry me as long as they weren’t going to hinder the use of the device. I have been leaving the stiffeners in mine, but I just now removed them and don’t really notice much of a difference at all given the thickness and rigidity of the leather. Some of Oberon’s designs cover both the front and back of the cover, and with eighteen images to choose from and two color choices per image, it is easy to get lost when trying to decide which one to choose. I agree. They are all so pretty! I love how the designs wrap around on the ones that I picked. Oberon includes a lagniappe in the form of a complementary designed pewter key charm with each cover; I gave mine to Sarah to use as a necklace. 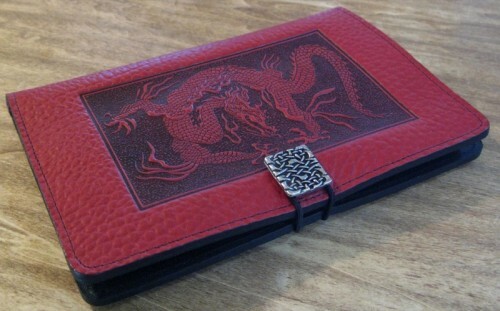 When my cover arrived, I was immediately impressed by the depth and dimensions of the dragon’s design. 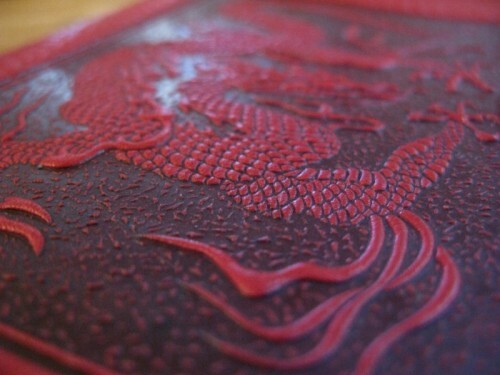 Since I opted for this particular pattern, only the front of the cover has the dragon design. The rest of my cover is composed of a thick, pebbly grained leather, which reminds me of the thick bull shoulder made to make western boots. I received my dragon cover several weeks ago, just before Oberon started sending them with matching pewter buttons for each particular design. Mine has a carved Celtic knot, but the newer dragon covers come with a dragon themed closure button, and each other cover style come with a similarly designed to the central theme carved button. On the outside, my cover looks the same as one with the corner straps system would. When opened, a card with a spare elastic band is tucked into the left. On the right is a sheet with the covers specifications with printed installation instructions on its back. Installing the Velcro cover is easy: Make sure the back of the Kindle is clean, peel off the Velcro strips’ adhesive covers, and then lay the Kindle directly on top of the strips exactly as you want it to be held. Once installed, my Kindle now has ~0.25″ extra cover on three edges, and while it’s not perfect protection in the event of a drop, it is certainly better than average. What I particularly like is that my Kindle’s buttons and ports are not obstructed in any way, and the entire package has a beautiful clean appearance that I don’t feel would be present with straps. Since I’ve removed the interior ABS plastic reinforcement panels, my cover is slightly less rigid than it was originally; I have found that it is definitely growing softer and more molded to my Kindle through regular use. 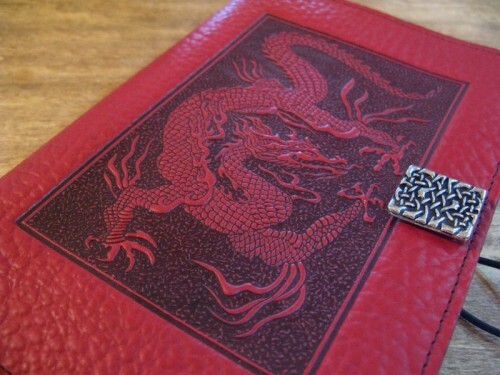 I usually fold the front flap of the cover behind the Kindle when I am reading, and I have really grown to love the dragon design. I just ordered a Kindle DX and one of the first things I did was write Oberon Design to make sure that they would be offering a cover for it; they will be. I can’t imagine putting a boring cover back on my Kindle now; I have grown completely spoiled. I’m also a bit bummed that I dropped $100 for the Cole Haan case, and at $75 this one blows it away not only in looks, but also in value. 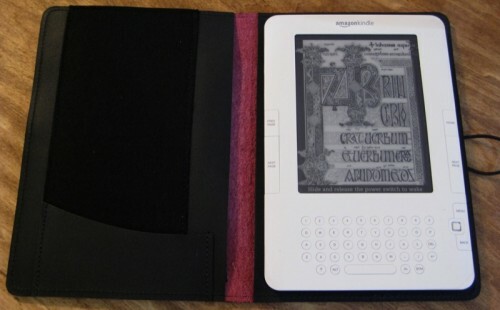 I requested covers for both the original and latest Kindle models. I opted for corner straps on both since I hate sticking stuff to my devices. From the outside, it’s not apparent which cover is for the Kindle 1 and which is for the Kindle 2. 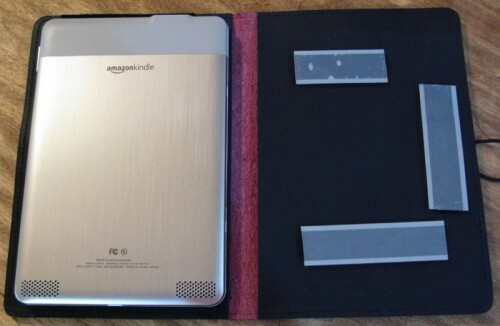 The Kindle 1 cover is slightly smaller, but as you see above, you can’t really tell even when they are side by side. Let’s look at the Kindle 2 cover first. I received them around the same time that Judie did, so I also have a Celtic clasp button. I like it though, so I wasn’t bummed to learn that they now are making their covers with the matching buttons. 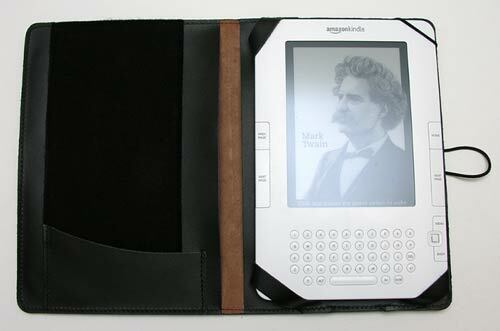 The Kindle 2 is held in place with three wide leather straps and a thin elastic band. It’s not difficult at all to insert the reader and once situated, all features, buttons, etc are fully accessible. The Kindle is held securely and there’s no worries that it will fall out accidentally. 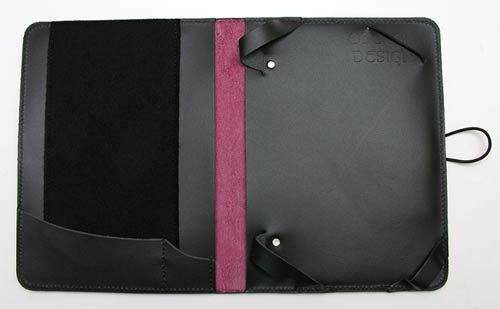 The soft fuzzy lining of the cover along with the rigid leather protects the screen from scratches. Also, there’s no need to remove the Kindle 2 from the cover in order to charge it. I’ve been using this cover for a couple of weeks now and have liked it very much. Although it’s not as soft to hold as the M-Edge cover that I was using previously, I just love the design and uniqueness of it. Let’s look at the Kindle 1 cover now. It’s pretty much identical to the Kindle 2 cover when it comes to construction. It has the same fuzzy screen protector lining on the cover side and the 3 wide leather straps and elastic band that comprise the holster. The leather straps hold the reader in place very securely and it is not hard to insert and remove. But I noticed a problem within seconds of placing the Kindle 1 in the cover. 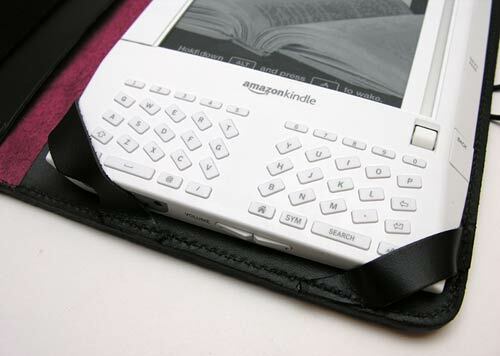 The two bottom straps cover two buttons along the bottom edge of the Kindle. That might not be a big deal except that the buttons are the ones that are used to wake and put the Kindle to sleep. You can press the buttons through the straps, but I don’t really care for that fact. If you plan to get a case for your Kindle 1, I’d go with the Velcro version as I think the strap version of the cover is better suited for the Kindle 2. The price may scare some people, but these covers are unique and are made very well and I can imagine them lasting for years and years. 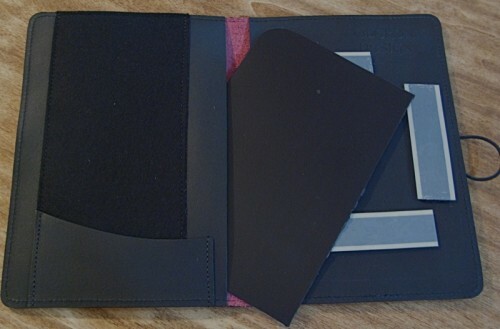 Oberon Design Kindle and Kindle2 covers are available with or without Velcro directly from the manufacturer.